Recently, I showed you our backyard play house and shared some sandbox ideas with you. 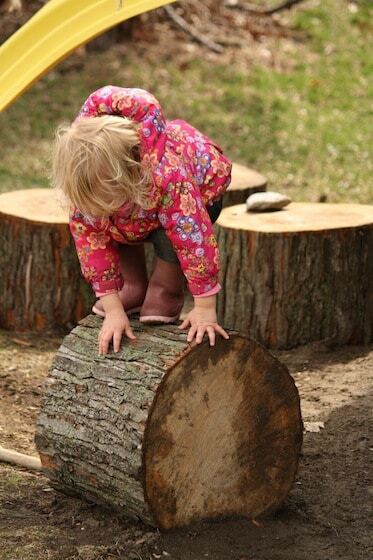 Well today, I’m just busting to share the newest addition to our backyard play space: Play Logs! Late last fall, my Dad, who has been in the tree business all his life, cut down a couple of massive Maple Trees for his next door neighbour. Now, I have to tell you that this was no small feat. My Dad is in his 70’s (his SEVENTIES!! ), and there he was 70 feet high in these towering Maples, spurs on, ropes tethered, chainsaw roaring, dropping huge limbs and branches like he was a man half his age. My Dad is honestly the most amazing man I know.Dad admitted that this job was a bit much at his age, and that he wouldn’t take on anymore of this size. I’d been pining play logs for a while, and knowing that this would his last big job, I asked him if he would set aside a few pieces of the trunk for me and the hooligans. Being that it was so late in the fall, we agreed that he would just hang onto them until I was ready for them in the Spring. My parents live just a couple of blocks away from me, and one night a couple of weeks ago, Dad pulled into the driveway with my logs in the back of his truck. I was so excited, you’d have thought he was delivering bars of gold. He and my oldest son used a fridge cart to move these 4 beautiful beasts into the backyard, and the following afternoon, on my day off, I got to work positioning them in the back corner of the yard, where we hooligans spend a great deal of our outside time. but close enough together that they could use them as a gathering spot to sit and chat, concoct great plans, and tell secrets. The 4th log, I placed on its side to add a little variation to the set up. This one is the biggest hit with the jumpers. To stabilize the logs, I dug down into the soil a little and tossed in a little sand before positioning the logs for good. I stood on top of each one, rocking it back and forth, and making adjustments until the logs were completely stable. and there was no fear of a log rolling or toppling under the weight of the children. Once all the logs were in place, I set out a few of our outdoor kitchen items; just enough to spark the imagination, and this is what the hooligans discovered when they arrived the following day. I love how magical and inviting it looks. Rather Alice in Wonderland, don’t you think? 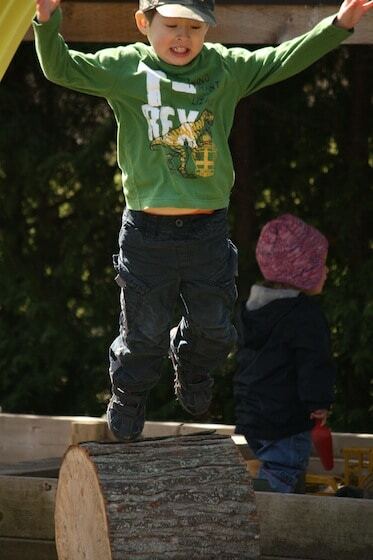 If you ever have an opportunity to score a couple of logs for your own backyard, jump at it! 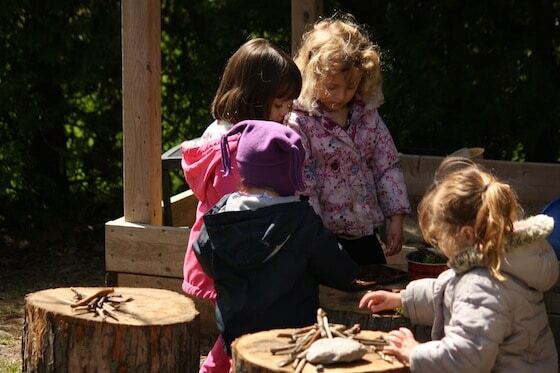 There are so many benefits to having a few of these in your outdoor play space. 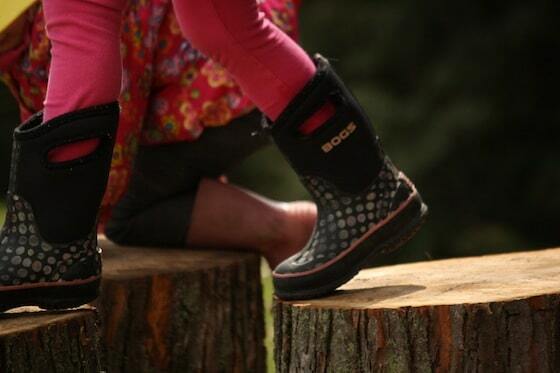 They provide children with a natural place to climb and jump, and they help to develop gross motor functions. 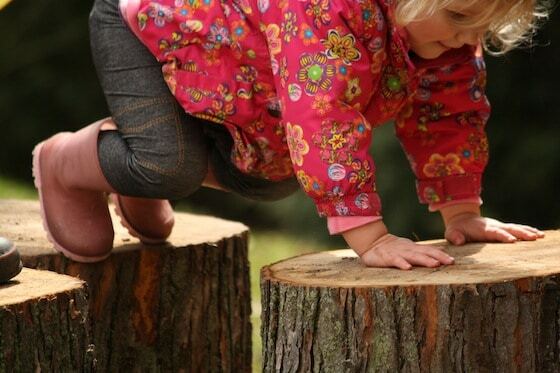 Balance, co-ordination and decision-making skills all come into play when a child decides to take a step from one log to the next, and without knowing it, they take depth, distance, risk and their own abilities into consideration every time they climb up or jump down from one of the logs. and the next, it’s an instrument for making music. and as tabletops for sorting “tools” and treasures on. 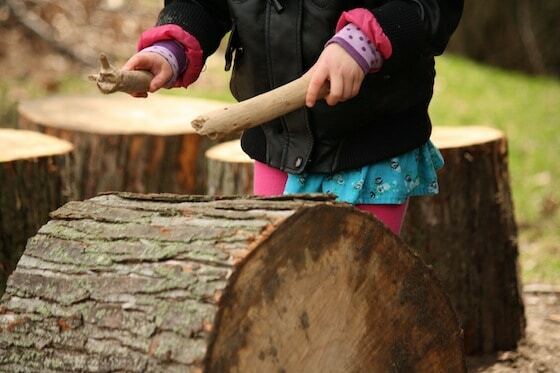 I can say without a doubt that our play logs have been one of the best backyard additions yet. In the weeks to come, I’ll be following up several more posts, in what I’m calling my “Backyard Series”. 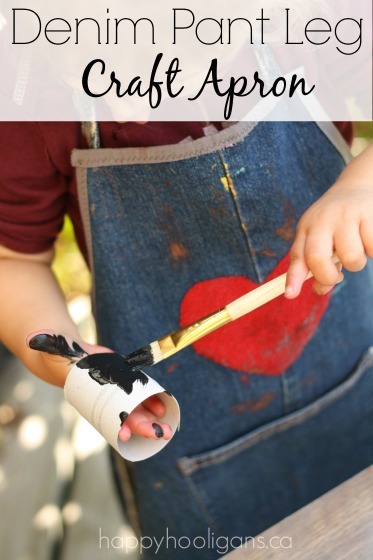 I’m really looking forward to sharing them with you, and passing along more simple ideas for creating a natural and inviting play space in your own backyard. 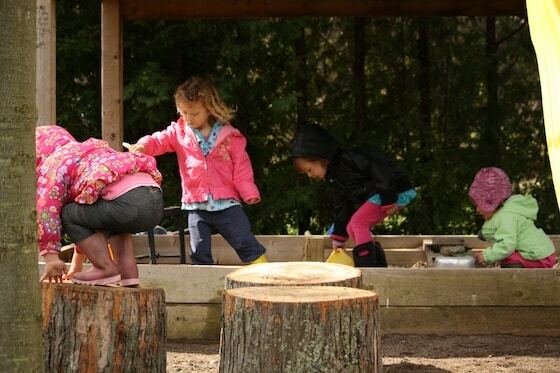 Other posts in this series: Sandbox Ideas – creating a natural play space in your yard. If this is your first visit to Happy Hooligans, I’d love for you to pop over and LIKE us on facebook. 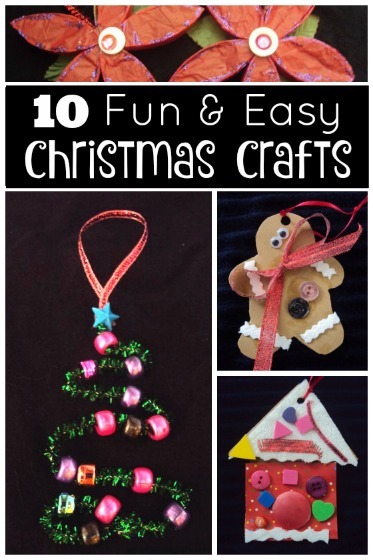 I update my page daily with easy and affordable arts, crafts and play ideas. You can follow me on Pinterest too! 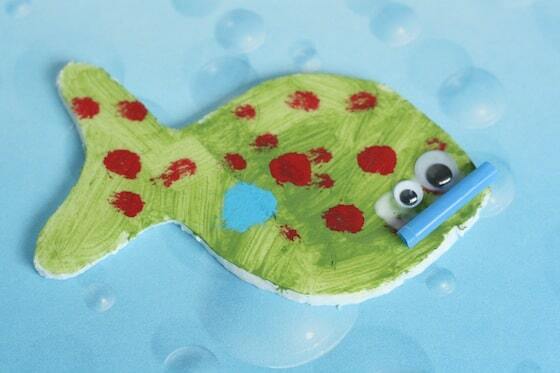 I have over 90 boards dedicated to all kinds of kids’ crafts and activities, as well as some personal interest boards too. Arlee, you could check with the city/municipality. They do a lot of tree removal, and might be able to set aside a few logs for you. Either that or check with a local tree guy (someone like my dad who has a private business), or with a tree removal company. I�m pretty sure you�d be able to score a few that way. If all else fails, when you�re driving around, keep your eyes open for anyone having tree work done. Hop out and ask them! You�ll get some. I know you will. love it! 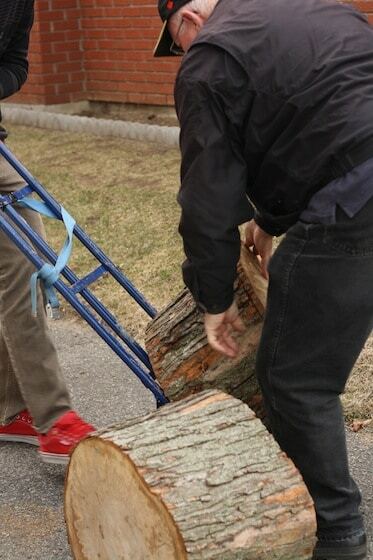 We have a large log with two smaller ones set about it as table and chairs in our yard. Such a simple thing but it’s so well-loved! Lovely, Jennifer! 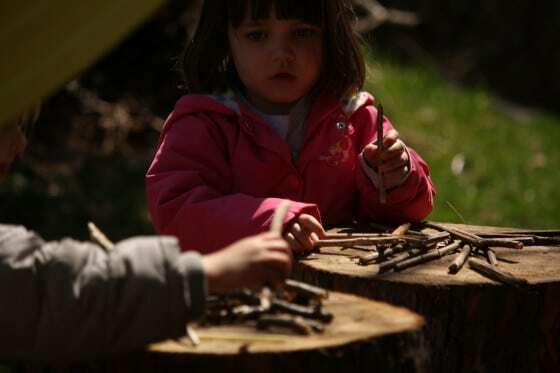 Kids always gravitate to the simple and natural, don’t they? 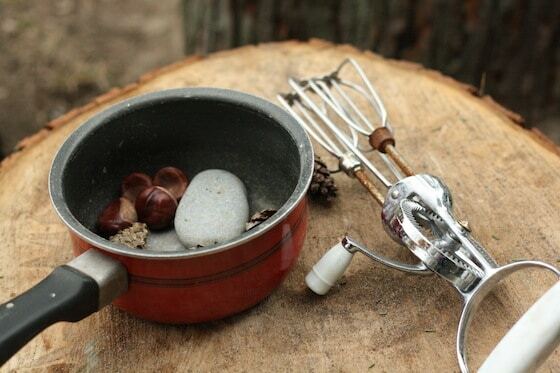 Oh how I LOVE this Jackie – especially the pics of the pine cones and stones in the muffin tins. Thanks, Ness. 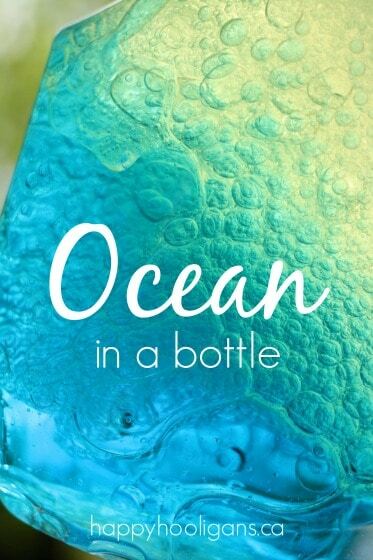 I love how magical the play seems when we play with natural elements like that. Jackie, I’ve been waiting eagerly to see how the Hooligans used the stumps and I’m loving it! 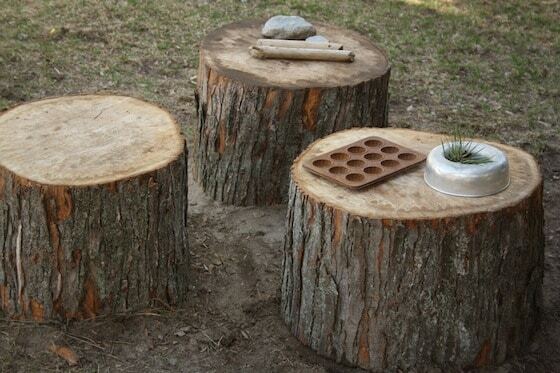 What a great way to incorporate outdoor materials into a play area! I wish more people did it. Love it! I too have always dreamed of logs for my backyard. 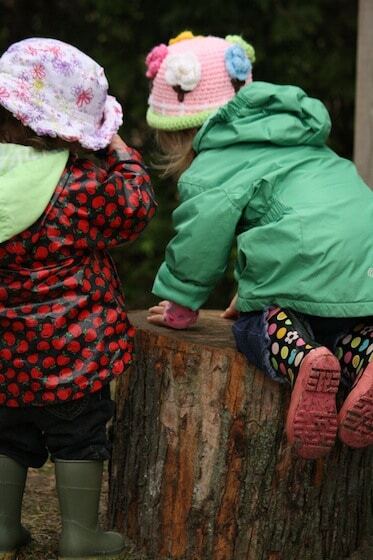 I think that even now that my girls are 7 & 9 yo, they would still enjoy playing with and on logs. Beautiful. BTW your dad is amazing! Love them Jackie & I can see they have become a part of the whole playscape immediately. Wow, I’m cooler than I realized! 😉 A couple of years ago, we had a big tree cut down (though we left a 5 foot stump on which to place a clay pot bottom as a bird bath), and while we gave most of it to a neighbor for firewood, we had 10 huge pieces of log about the same size as yours. Five of them I lined up at the front of our driveway, as a parking “curb”, and the other five we rolled down the hill into our boys’ play area. They have been sat upon, stood on, jumped from, you name it. 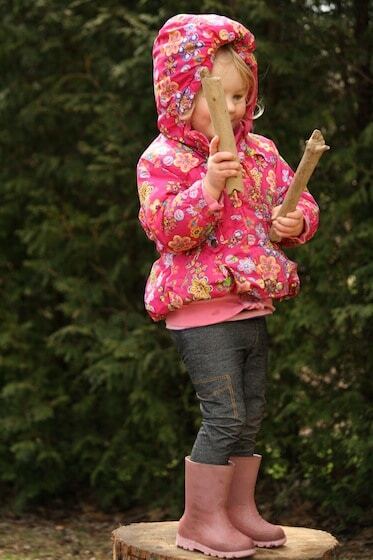 Just this past weekend, we had a yardful of kids over, and they took a long treetop limb (it had fallen out of a nearby tree during a recent storm) and placed it over one of the logs, then used it as an impromptu see saw. It worked quite well! Wow! That’s great, Cam. I love the see-saw idea! Smart kids!! I can’t wait to see what else you post in this series, Jackie! 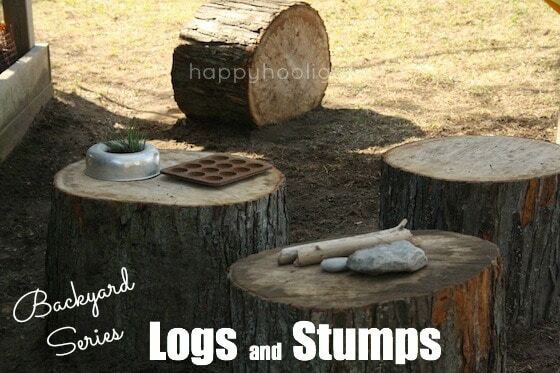 We have stumps in our outdoor playspace too. They’re arranged in a circle and we call it “the stump house”. I love that you put one on its side. We’re re-arranging things outside so when we move our stump house I’ll have to do that with one or two of them. We have tons of trees my husband has had to cut down over the past few years, and i have never thought to do this! My kids will be thrilled with their new play additions when I have the husband bring some up to the play area! 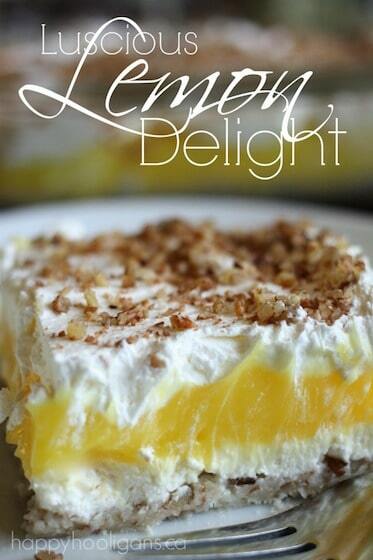 How awesome for you that you actually have some at your fingertips!! How fun!! 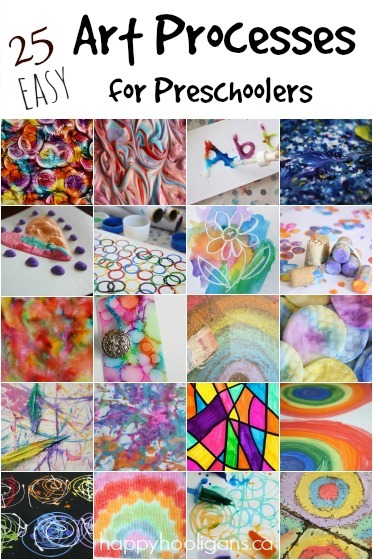 Thanks so much for linking up to Tot School Tuesday! What rolls down stairs, alone or in pairs, rolls over your neighbor’s dog? It fits on your back, it’s great for a snack, it’s LOG LOG LOG! LOG LOG everyone loves a LOG! LOG LOG come on and get your LOG! LOG LOG it’s better than bad, it’s GOOD! Haha! That’s great. THanks for the laugh, Luey! If I can get hold of some logs I will definately do this. Have you any ideas for car tyres please. This is wonderful! 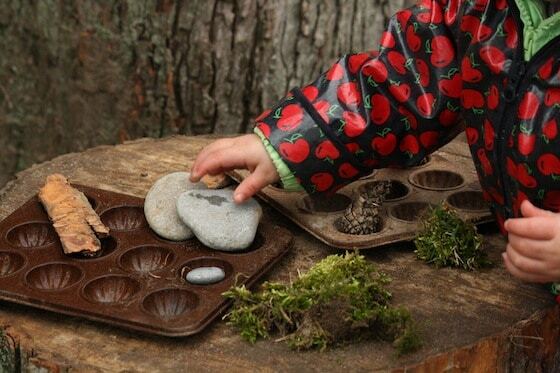 I love seeing natural items used for play. I had this idea awhile ago and when the town cut down a tree and made a bunch of stumps, my husband and I lugged some of them to our house. We are in the process of working to finish our back yard, so the stumps have been sitting out waiting for a permanent place. Some of them have begun to rot and fall apart, and I’m wondering how you have kept yours intact. I didn’t treat them with anything to preserve them Kaly. I wonder if it has to do with the health of the tree. The tree that my dad took down was in good health, and 2 years later, our logs are still in the same shape that they were when we got them. If a tree was in poor health, and starting to rot from the inside, maybe they wouldn’t last as long? I’m just guessing there. Hey just wondering about the height of the logs…. Thanks! 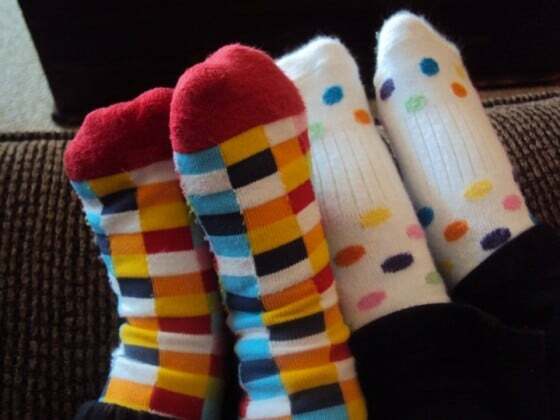 Our are about a foot and a half tall. The pictures in the post will give you an idea of how they compare to the height of my toddlers and preschoolers.